Painting By Gordon Frickers, marine art, 61 x 91.5 cm (24″ x 36″), oils on board, commissioned, sold. This original painting was a commission, “There is an enduring quality, capturing an aspect of our now for future generations, great painting.” said Capt J Simkins, Managing Director, Caledonian MacBrayne . The commission for Gordon Frickers was to paint not just one but several pictures to be hung on board, for presentations & for the company boardroom. He was picked following an earlier work of his, a painting of Castlebay, Barra; the most Southerly inhabited Hebridean Isles, which was commissioned to hang in Calmac’s “Clansman”. 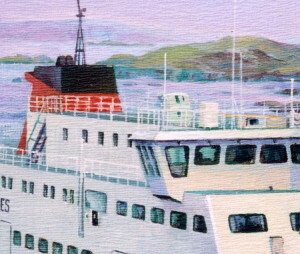 Calmac directors remembered & obliged, flying Gordon to Glasgow for a 3-day tour, accompanying the MD as he “did his rounds” of the ports and Western Isles, to sketch, photograph & paint possible backgrounds for their newest ship. From this and meticulously studying of the G.A. drawings, several delightful paintings emerged. 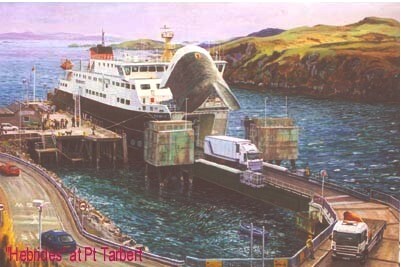 “Hebrides” is shown in an unusual way, unloading at Port Tarbert. The business of the ship, the depth of colour, the keen observation of the Hebridean light, the attention to on shore details is undeniably well captured. The series of paintings are remarkably fluid, convincing yet painterly. 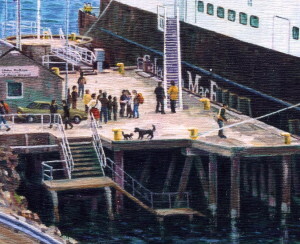 While paintings of ships abound, a painting of any ship unloading is rare and of a fleeting a moment in time. A working ship going about her core shore side business as opposed to working at sea, at the beginning of the 21st century, it will soon become a minor icon of the time, enjoy.